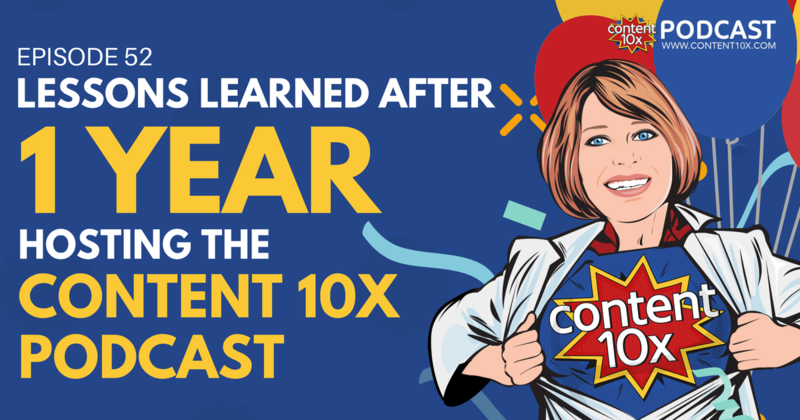 It's official...the Content 10x podcast is one year old!! In this week’s podcast and blog post I’ve taken the opportunity to reflect on what I’ve learnt from the podcast and attempted to give you my best examples of how you can repurpose your own podcast episodes (or other content if you don’t have a podcast), based on what worked for me over the past year. You can listen to the full episode below or read on for more detail and links to the specific examples I give. Whilst the podcast is one year old, the Content 10x business itself is older. I started Content 10x as a niche content repurposing agency about five months before I started the show. When I first got started, my main focus was on building the business. Most of my focus was on finding clients, delivering the best possible service, building systems that work and generating revenue. After about five months, however, it occurred to me that our situation was a bit ironic. We were creating all this GREAT content for our clients but we weren't creating any content for ourselves! I thought hard about what the core content should be. Should it be a video channel, a podcast, a blog? I put it to my good friend and mentor, Chris Ducker. I asked him, if he was me, given all the years of content that he's created and successful businesses he's built, what would he do? He said he would start a podcast. According to Chris, a podcast is the best way to build authority and connect with my audience. When I started the podcast, I already had my team in place. Writers, graphic designers, video editors and podcast editor. We got together and worked out how we were going to repurpose the podcast episode every week. Every week, on top of the foundation, we have an opportunity to get creative. Testing ideas is a big part of why having the podcast has been so great. It's been a sandbox of experimentation for us. While our client work needs to be more constrained and agreed on ahead of time, our podcast is something we can play around with and test things out which we can later suggest to our clients if they work out. In essence, the podcast has been a great little guinea pig as well as a form of content marketing! Over time we've experimented with infographics, additional posts and articles for different sites, training courses, slideshows, extra videos, talks, masterclasses… all sorts of things. My key lessons are covered in a bit more detail below and I also highlight some examples of creative experiments we ran on the Content 10x podcast that you can try out yourself. I know you’ve heard it before, but hear it again. I’ve just released episode 52, marking one year of weekly episodes. I haven’t missed a single week, and I don’t intend to. But what about when you have events, conferences, or even just holidays that get in the way of the production schedule? Do you just skip a week? No. Never miss a week (or whatever your production cadence is). If you can, batch your content ahead of time. If you can’t, (if your content requires very timely, news-like content, for example), have someone else fill in for you. Whatever your schedule is, commit to it and stay consistent. I feel like if I even miss one week I would be tempted to miss another week, and then another, etc. It's just not something I'm going to do. Podcasts are engaging. They're immersive. They’re (relatively) easy to get started with and they create a real sense of connection between yourself and your audience. Having said that, they are less discoverable than some other forms of content. So, if you’re going to run a podcast, plan to start promoting from the get go. 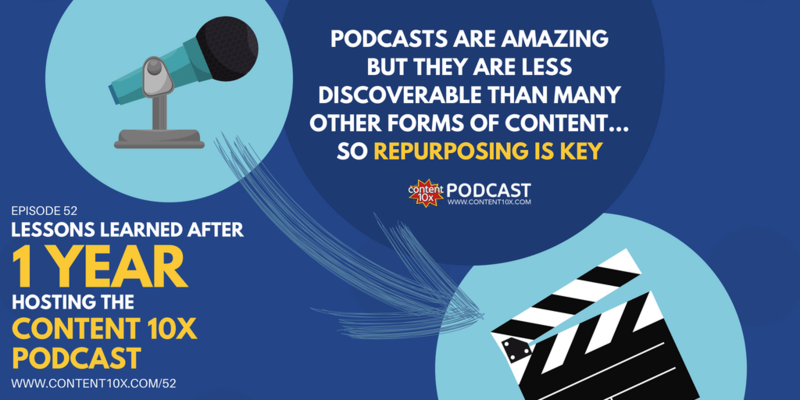 Luckily for you, when it comes to content repurposing, podcasts have loads of potential. Get all that hard work you put into every episode into different formats (articles, graphics, videos) and into different places. We’ve also talked about how much repurposing potential there is in live video, but whatever you choose, whether it’s a podcast or a video channel or simply a blog, try to spread your content over multiple places to get in front of multiple audiences. I have definitely found that podcasting is a long game. You have to stay with it. Don’t expect too much within the first six months. You have to stay consistent and enthusiastic while you watch your listenership grow slowly for a long time. It’s not easy. You’ll probably feel disheartened. Just remember that every “famous” podcaster went through this stage (unless they had millions to spend in promotion or a huge audience to begin with). The people who win at the game of podcasting (or any other content format) are those that persist through the slow, quiet times. Repurposing helps move this process along considerably. Whilst podcast “success” might be measured in the number of downloads, you can have a wave of “spin-off” content associated to each podcast episode that gets discovered on all sorts of different platforms. I truly believe I have done well with staying consistent and creating lots of content because I am good at planning out all the podcast episodes as far in advance as I can. I plan who I'd like to have on, what topics I’d like to discuss, and where there are gaps in the content I’m going to share. I think about what my audience needs to know and always endeavour to cover things I haven’t totally covered before. I don't just plan what all the episodes are going to be. I plan every single episode. I spend quite a lot of time simply writing them down before I record them. That practice has helped the podcast immensely. Be as creative as you can with your content. Just because you have procedures in place that make your repurposing steady and reliable, remember to shake things up from time to time and try something new. We've had so much fun repurposing our podcast episodes. 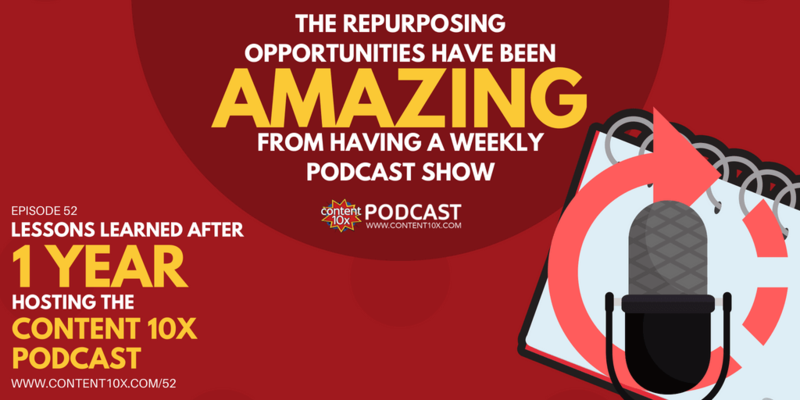 Let’s take a look at some of our best examples of creative podcast repurposing. All the way back in episode 4, How to Repurpose Your Blog Post into an Infographic, we already had a standard repurposing process – a blog post, social media content, and video – but we also made a fun and engaging infographic. We decided to create an infographic again when episode 7 came around, 4 Clever Ways to Repurpose Your Facebook Live Videos. We went really gung-ho with that episode, also creating a video tutorial and a content upgrade for list building. For a great example of turning a podcast episode into an engaging presentation, go to episode 5, The Biggest Mistake You Can Make When Repurposing Your Content. You can use an engaging slide presentation in multiple ways. We put the presentation on SlideShare, for example, to immediately increase the likelihood of being found by new people. You could also use a presentation as the basis of a webinar where you go through each slide and expand on the points it makes. In episode 9, How to Repurpose Your Content Using GIFs with Andrew & Pete, we talked about how to create GIFs quickly and how to use them in your marketing. Andrew and Pete are two very innovative marketers who are really plugged into how the online world works. They run Atomic, a membership community focused on how to market using super-shareable content. Inspired by my chat with the dynamic duo, we had some fun creating a few GIFs alongside the usual video teasers for social media. They can be a really creative way to repurpose your content. For episode 10, Repurposing & Respecting the Social Media Platforms, we worked through a bunch of different repurposing options. We only had audio to start with. From that, we created a blog post. Then, from the article, we created a video. Go to the blog post and scroll down to the bottom. You'll see a video titled “Content Repurposing & Respect". We used a software called Lumen 5. I did an entire episode on this great piece of software, but episode 10 is the first time we experimented with it. Creating a video from written or audio-only content can be a bit challenging. But using Lumen 5 doesn’t require any advanced video skills and makes it just fun and creative. Content upgrades are fantastic. Think of them as lead magnets that are specific to the current content you’re consuming. It might be a checklist or a cheatsheet, maybe a bonus interview or a template or swipe file. Anything that enhances the content you've already created. They work really well and they’re quite easy to create (depending on what you want to create!). Head over to episode 24, Repurposing Your Content into a Content Upgrade for a full breakdown of what you can do. For the episode itself, I created an accompanying blog post and then repurposed that into a content upgrade. I always try to practice what I preach! Although people rarely talk about this, there is a tonne of repurposing potential in a speaking event. In episode 43, titled Podcast Movement: How to Become Loved as a Podcaster by Those Who Hate Podcasts, I share the talk I gave at Podcast Movement in Philadelphia, July 2018. I was surprised by all the repurposing potential I gained from this talk. I had the video footage, the slides I created, the talk itself which I repeated on the podcast, and loads of social media content (including photos from the event itself). You usually put a lot of time and effort into creating content for talks. There’s no sense in not maximising the value you can get from all that investment. The biggest thing I’ve learned from the last 12 months of podcasting is that content really is king. Building a wealth of content, week on week, feels really good. We know we’re creating a marketing arsenal to support the continued success of the business. If you haven’t already, pick a single thread of core content and start building repurposing procedures around that core to multiply what it can do for you. Was there anything this week that surprised you? Comment below or find me on Twitter or Instagram to tell me what you’re going to try out on your own podcast or blog. Here’s to another year of podcasting for me.